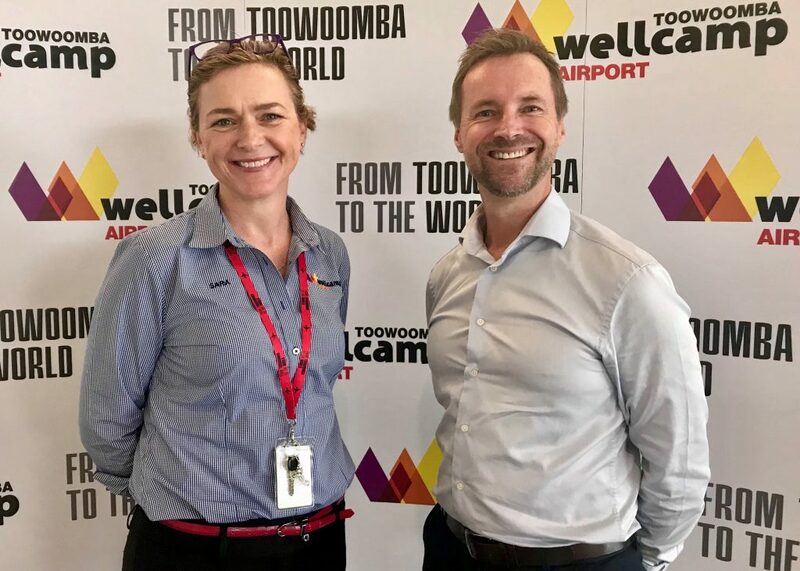 RDA Sunshine Coast CEO Paul Fisher and committee members Leanne Layfield and Tim Marchington recently embarked on a road trip to Toowoomba Wellcamp Airport – a pioneer in regional aviation. As Australia’s first privately funded, public airport, the first greenfield airport to be built in Australia in over 50 years and Queensland’s newest cargo hub, the airport has entered into the history books. There, in the wake of the upcoming Sunshine Coast Airport Expansion Project, the team met with General Manager Sara Hales to discuss how the private airport has built its success since opening in 2014. With 80 plus flights weekly, Wellcamp Airport is connecting Toowoomba and the Darling Downs region to the world. It offers interstate, intrastate and international connectivity for the Darling Downs, Granite Belt, Surat Basin and Southern Downs regions. In addition, it operates a fully-licensed international air cargo terminal in conjunction with Menzies Aviation and is the home of Queensland’s only dedicated 747-8F International Freighter Service. The new state-of-the-art terminal features a contemporary design using lots of glass and light, simple, clean lines and a mix of timber, polished stone flooring and exposed concrete features. The 8,000 square-metre terminal was designed by award-winning Guida Moseley Brown (GMB) Architects and constructed by Toowoomba-based FK Gardner & Sons. Hanging pride of place in the terminal is statement piece, the Southern Cross Aviation SC-1 prototype, which was built at the Toowoomba Foundry in the late 1950s and made its first flight in 1961. In 2018, the airport won the AustCham Westpac Australia-China Business Excellence Award in the Construction, Infrastructure and Natural Resources category. The Sunshine Coast Airport (SCA) Expansion Project will deliver a new 2450m X 45m runway compliant with regulatory standards, runway end taxiway loops, an expanded apron and terminal facilities, new access roads and utilities. The expansion is said to enable direct flights to more destinations across Australia, Asia and the Western Pacific, enhancing national and global connections. It is also expected to generate jobs and economic growth, boost tourism, help export businesses and secure air access to the Sunshine Coast for generations to come. It is proposed that the construction of the new runway and associated facilities will be fully operational during 2020. For more information on the SCA expansion, visit https://www.sunshinecoastairport.com.au/corporate/expansion-project/project-background/. This entry was posted in News and tagged air travel, airport, Entrepreneurship, exports, freight, innovation, jobs, Paul Fisher, RDA Sunshine Coast, RDA Sunshine Coast committee, SCA, sunshine coast airport, Sunshine Coast Airport Expansion Project, Toowoomba Wellcamp Airport, tourism.